Restoration Agriculture offers vibrant, productive, real-world alternatives to save water and restore our soils. 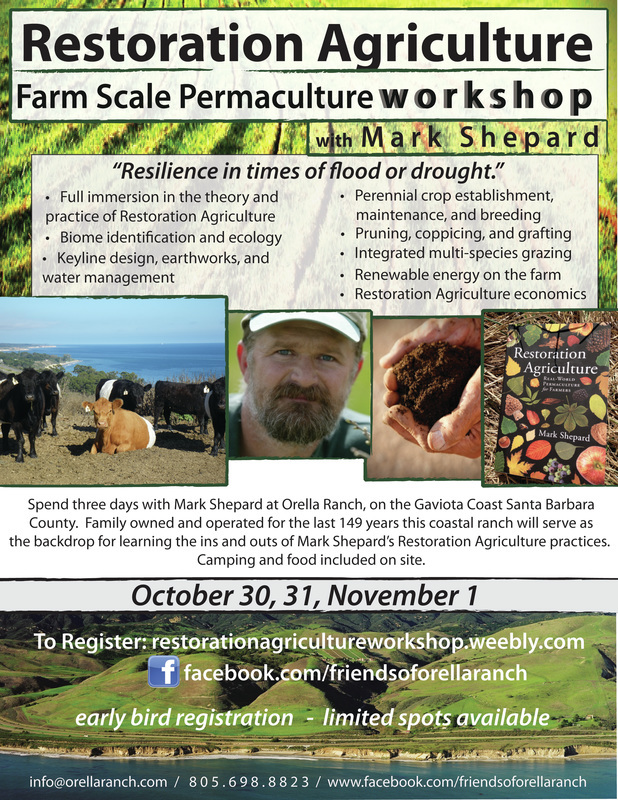 Spend three days with Mark Shepard, at Orella Ranch on the Gaviota Coast learning the ins and outs of Restoration Agriculture for resilience in times of flood or drought. The workshop is full, We have a waiting list. Please register for the waiting list, and if a space opens up, we will contact you. Thank you. Restoration Agriculture, farmer New Forest Farm, featured in INHABIT a film on permaculture. Learn more about Mark Shepard here. Where: Orella Ranch ~ on the Gaviota Coast in Santa Barbara County. Family owned and operated for the last 149 years this coastal ranch will serve as the backdrop for learning the ins and outs of Mark Shepard’s Restoration Agriculture practices. Camping and food included on site. The workshop will draw extensively on Mark’s experience establishing and developing New Forest Farm as one of North America’s largest and most innovative perennial farm ecosystems. Using nature as a model, Restoration Agriculture is the intentional restoration of healthy, functional ecosystems as the context for economically-viable farm operations. Perennial crops, livestock, fungus, and pollinators are integrated to produce abundant food, fiber, and fuel crops while simultaneously restoring critical ecosystem services such as carbon sequestration, water purification and infiltration, nutrient cycling, and biodiversity. Participants will be immersed in the strategic how-to’s of implementing Restoration Agriculture beginning with the agroforestry techniques of Alleycropping and multi-species Silvopasture grazing. Mark will also cover how to implement water management systems based off of natural patterns and informed by Keyline patterning pioneered by P.A. Yeomans. Inputs-based agriculture, pest and disease cycles, plant and animal breeding, compost & compost teas, nitrogen-fixing woody plants, 16-brick rocket stoves, herb spirals and hugulkulture all get a mention before winding up with a passionate call to arms for all farmers, land owners or aspirants, to rise to the challenges of our times, to live and work toward the creation of an ecologically healthy food system, culture and economy. Pair discount: $40 off your combined total. Ask us about group discounts for 3 or more. Space is limited - Register early to reserve!